After supper, Othello invites Lodovico on a walk. Before leaving, he orders Desdemona to go directly to bed and to dismiss Emilia. Emilia helps Desdemona prepare for bed. As they discuss Othello, Emilia says that she wishes Desdemona had never met him, but Desdemona responds that she loves him so much that even his bad behavior has a kind of grace to her. Yet Desdemona's next words is to instruct Emilia to use the wedding bedsheets as a shroud for her should she die. Desdemona then sings a song called "Willow" that she learned from her mother's maid, a woman who's husband went mad and abandoned her. Desdemona remains as faithful here in her love as in 1.3, despite the fact that Othello has berated her and that she even seems to sense that he might kill her. Her devotion to Othello even should it cost her her life could not contrast more strongly with the graphic, misogynistic picture of female sexuality Iago has described throughout the play. Othello is so threatened by the possibility of having been cuckolded that he can't see the reality of his incredibly faithful wife. Desdemona then asks Emilia whether she would commit adultery. Emilia responds that woman are just like men, and will cheat on their husbands if their husbands cheat on them. Desdemona responds that she does not want to learn how to emulate bad deeds, but instead how to avoid them. She dismisses Emila and goes to bed. Emilia presents a cynical view of marriage, in which one bad deed inspires another. Though it should be noted that Emilia seems to think that men always cheat first, while the men suspect the women will cheat first. Once again, Desdemona's displays her incredible virtue and faithfulness, which in his jealousy Othello can no longer see. Weigel, Moira. "Othello Act 4, scene 3." LitCharts. LitCharts LLC, 22 Jul 2013. Web. 10 Dec 2018. Weigel, Moira. "Othello Act 4, scene 3." LitCharts LLC, July 22, 2013. 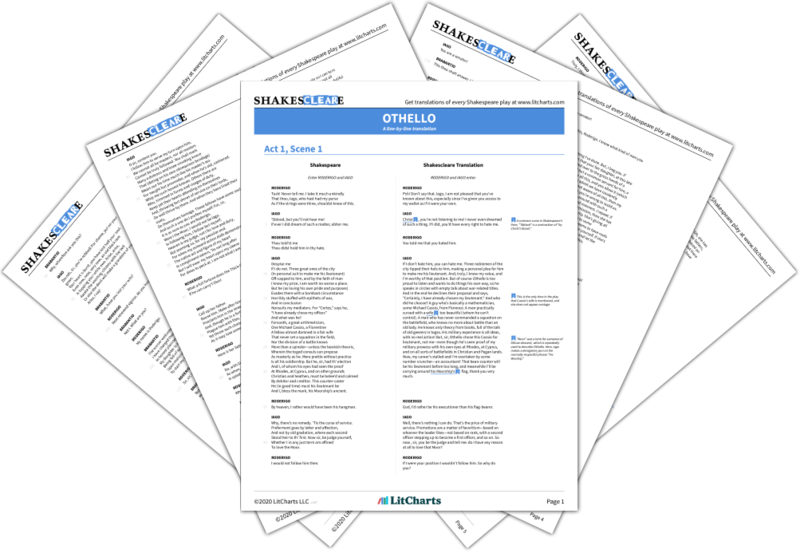 Retrieved December 10, 2018. https://www.litcharts.com/lit/othello/act-4-scene-3.